framework to their constructivist version of cognitive therapy. Given that the large majority of Italian cognitive therapists adopted Guidano and Liotti’s approach, they all started applying the ABC framework and are still applying it today. However, Italian therapists adapted the ABC framework to their constructivist training. For example, Guidano and Liotti interpreted the ABC framework as aimed at promoting cognitive and emotional awareness in clients, while they considered the ‘disputing’ phase to be not compatible with the constructivist principles they held. They also encouraged the application of John Bowlby’s ideas to REBT and the use of life experience report techniques in the ABC. Sandra Sassaroli and Roberto Lorenzini applied George Kelly’s ‘‘laddering’’ technique to the ABC framework, a technique more focused on dilemmatic structures than on REBTian dysfunctional thought. 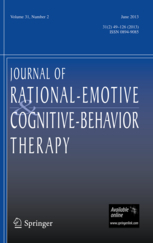 Caselli investigated REBT’s in?uence on Adrian Wells’ metacognitive version of the ABC. Finally, Ruggiero and Ammendola have made a strong call for ‘‘back to Ellis’’. This implies that any innovation should involve a more stringent and faithful pplication of REBT principles.